Judge Shigeru Oda, having served since 1976 in three successive nine-year terms on the International Court of Justice, has helped to shape the Court's jurisprudence for over a quarter century. His influence on the law of the sea spans an even longer period, beginning with his doctoral dissertation at Yale Law school in the 1950s and continuing with his involvement in the First, Second and Third UN Conferences on the Law of the Sea. In a tribute to Judge Oda's significant contributions to international law, leading scholars on the law of the sea, international dispute settlement and the ICJ itself have produced a Festschrift in his honour that promises to be a standard reference work on these topics for years to come. 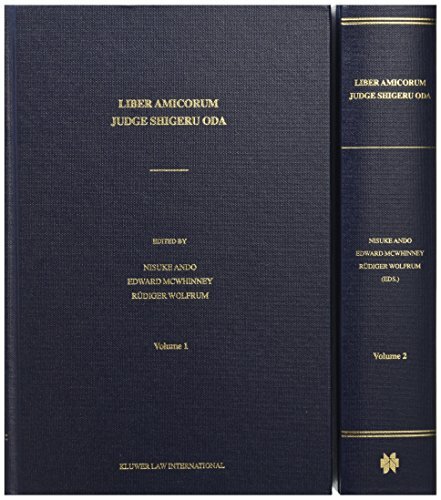 This two volume work, containing over 95 articles, begins by examining the role of the international judge and the jurisdiction of international tribunals (including reservations to jurisdiction, the Optional Clause, the Special Agreement, and the power to indicate special measures). It contains a particularly lively debate regarding the proliferation of international tribunals and whether the potential for conflicting decisions is problematic or productive. Other areas of focus include the history and current development of the law of the sea; the first in-depth examination of the establishment and first decisions of the International Tribunal for the Law of the Sea; and the ICJ's treatment of the development, doctrines and sources of international law. Further sections are devoted to International Litigation as analysed by leading practitioners; Land and Maritime Boundaries, International Watercourses and Other Waters; and Defence, the Use of Force and the Law of Armed Conflict. The composition of the editorial team - Nisuke Ando of Kyoto, Edward McWhinney of Ottawa and Rudiger Wolfrum of Heidelberg - reflects Judge Oda's truly international career and the extent to which his work has drawn from and contributed to diverse legal traditions.